My mother makes the best deviled eggs. What I like about them is the filling is always jam-packed with scallion. I love the flavor of onion! I went to a dinner party once where the hostess served baked mushrooms as an appetizer. I could not stop gobbling them down and had to ask for the recipe. She told me it was sour cream and a packet of French onion dip mixed together, stuffed in each mushroom cap, and then baked until brown. I’ve made that appetizer for nearly everyone I know, with great success. 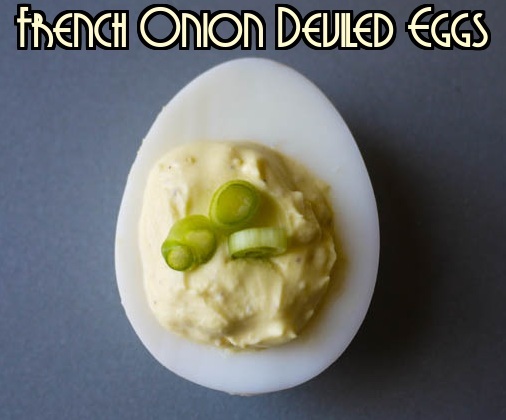 When I was coming up with this recipe, I wanted to see if I could combine my mother’s excellent deviled eggs with that French onion filling, without using a packet of French onion dip. I think I’ve succeeded. 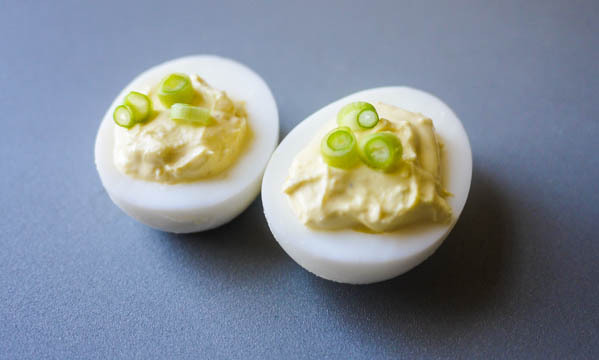 In addition, substituting sour cream for the traditional mayonnaise makes these super light! Don’t be intimidated by the use of Beau Monde Seasoning. The first time I heard of that ingredient, I thought it was going to be something incredibly expensive and only stocked in specialty shops. Nope. It was right there in my local grocery store and most likely, it’s in yours too, but you weren’t looking for it before. If you can’t find it, just mix celery salt and onion powder. If you want the filing to take on a more “ranch dressing” type of flavor, add a teaspoon of dill to the filling. Hard-boil the eggs and let cool. Once they’re cool, remove the egg shells. 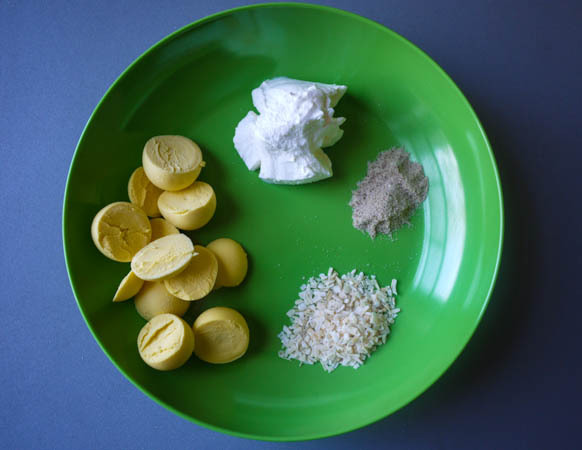 Place the yolks in a bowl with the dried minced onion, beau monde seasoning, sour cream, dried dill (optional), and salt and pepper. Let the mixture sit in the fridge for at least 30 minutes, so that the dried onion will soak in the sauce and become tender. If you don’t do this, the minced onion in the filling will be hard and crunchy and very unpleasant. 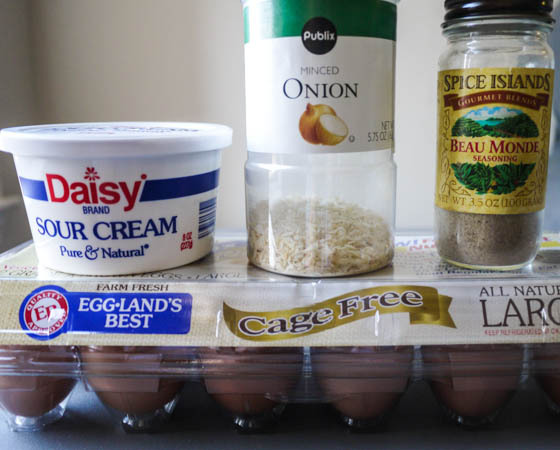 Spoon mixture into each egg half. Sprinkle with scallion and serve. Hard-boil the eggs and let cool. 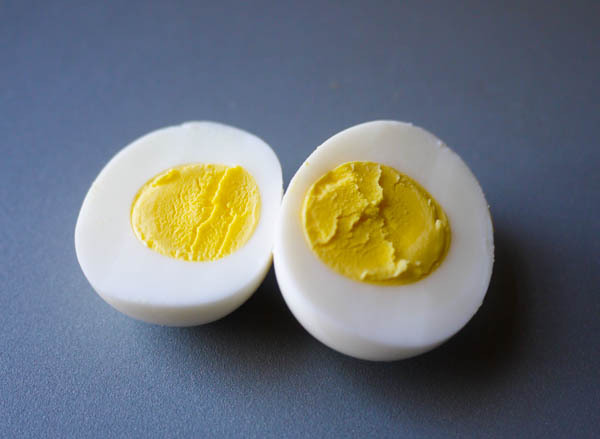 Cut each egg in half and place the yolks in a bowl. Add the dried minced onion, beau monde seasoning, sour cream, dried dill (optional), and salt and pepper to the bowl with the yolks. Let the mixture sit in the fridge for at least 30 minutes, so that the dried onion will soak in the sauce and become tender. Spoon mixture into each egg half. Sprinkle with scallion and serve. 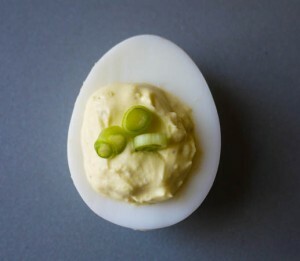 I remember making deviled eggs for you since you were a little girl. They were your favorite appetizers. I was thrilled to see the twist you added to the recipe and how delicious it is. From now on, I will change my recipe to include the French Onion dip. Great job! Your Dad and I love your creativity!! remember making deviled eggs for you since you were a little girl. They were your favorite appetizers. I was thrilled to see the twist you added to the recipe and how delicious it is. From now on, I will change my recipe to include the French Onion filling. Great job! Your Dad and I love your creativity!! These look delicious. A must try. Would also love to try the mushrooms, but they are not listed in your recipe index.